Posted on Sun, Feb 12, 2012 : 12:44 p.m.
Valentine's Day is the holiday that celebrates romantic love, and that's true - in a sense - for skunks, as well. Feb. 14 marks the start of the skunk mating season, according to a recent article on Arborweb, the online channel of the Ann Arbor Observer. 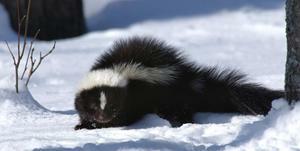 Skunks will be coming out of semi-hibernation now, ready to procreate. By summer, the skunk population will again increase as baby skunks join their adult relatives in nature - and under decks, behind woodpiles and in other areas a little too close to humans. Some areas of town already are seeing that, particularly on the city's west side. That's also the area where three rabid skunks were discovered last year. Mon, Feb 13, 2012 : 11:33 a.m.
Mon, Feb 13, 2012 : 11:05 a.m. I've been smelling these little buggers for over a month now, &amp; am seeing them smushed in the roads. I think the warmer, milder winter has them out early this year looking for love. Mon, Feb 13, 2012 : 4:02 a.m. IN the last week two of these local pole cats have been taken out by automobiles, gotta like that. Mon, Feb 13, 2012 : 3:13 a.m. I have a pet skunk that has never seen another of its kind. I'm afraid it won't... know what to do, if I let it mingle. Can we also get a guide posted, to instruct otherwise clueless skunks in the ways of love? Mon, Feb 13, 2012 : 1:57 a.m. Thank you for your coverage of this very important local issue. The lamestream media has, for so many years, completely ignored the mating habits of skunks, opossums and—if you can believe it—rabbits. Sun, Feb 12, 2012 : 9:33 p.m.
Mon, Feb 13, 2012 : 1:43 p.m. I take it whenever I can get it. Sun, Feb 12, 2012 : 10:55 p.m.
Every mating is special, not the day. Sun, Feb 12, 2012 : 8:31 p.m. Sounds like, the annarbor.com hates the valentine's day so much. We first got warning of being stalked, now are compared to skunks. I don't like any commercialized holiday. Valentine's day is not a special day for matting. BTW, I have received my copy of &quot;the gift of fear&quot; from amazon.com on Friday and start reading &quot;persistence, persistence&quot;. To my stalker: 1. Don't call me without speaking, 2. Don't try to take me out for dinner, 3. Don't send me red roses, white lilies are perfect. If I were your stalker I'd be confused from your mixed messages. Sun, Feb 12, 2012 : 8:08 p.m.